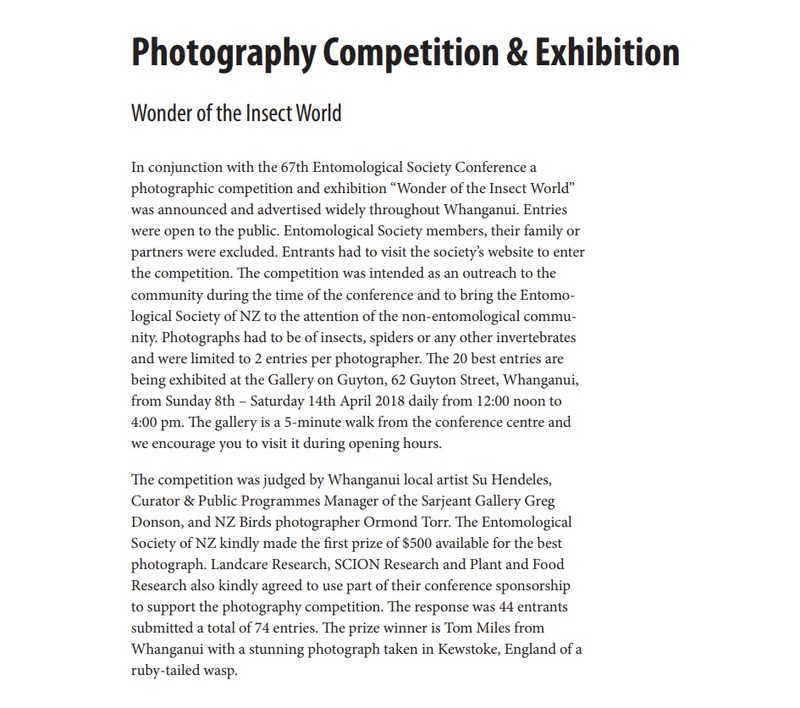 Tom and I recently entered a photography competition put on by the Entomological Society of New Zealand. A family friend of ours, knowing our love for wildlife photography, saw it advertised in the local paper and gave us the article. It was only a couple of days before the closing date, so we both chose two of our favourite critter photos and submitted them online. A couple of weeks later, much to our excitement, we found out that both mine and Tom’s photos had made it through to the finals! These photos were put on display in the Gallery on Guyton along with 16 other finalists. The following photos are the images we submitted along with the blurbs that we wrote to accompany them. In this photo, you can see a group of ants carrying off a tamamushi (Chrysochroa fulgidissima) head. I came across this little hive of activity whilst visiting Warei Shrine in my Japanese hometown, Uwajima. Tamamushi (玉虫) literally translates to ‘jewel bug’ which, as you can see, is very fitting. It is a metallic wood-boring beetle in the family Buprestidae, and is native to Japan and Korea. In this photo, you can see a gomadara-kamikiri (Anoplophora malasiaca) in the midst of take-off from my hand. It landed on me as I was cycling to a friend’s house, so I quickly whipped out my camera and took this shot. 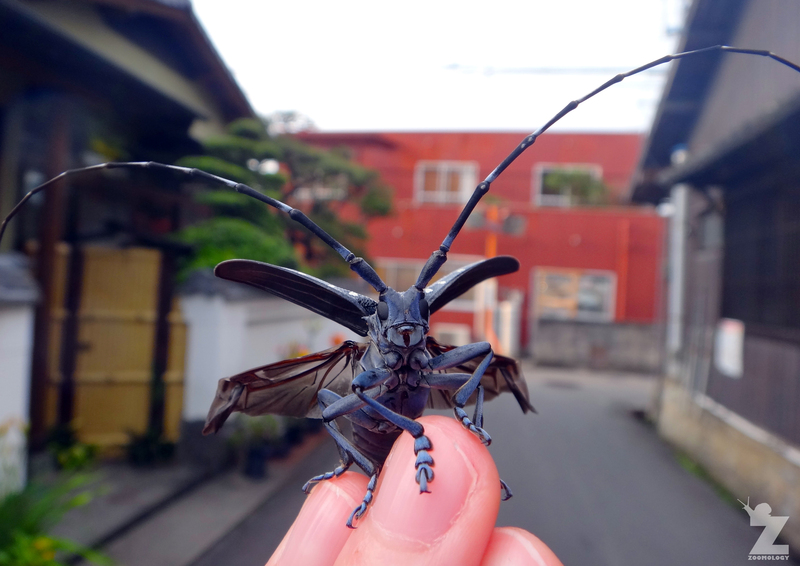 The gomadara-kamikiri (胡麻斑髪切) is a longhorn beetle that is found in Japan, Korea and Taiwan. They can do serious damage to trees, so are not loved by the many citrus farmers whose crops make Ehime famous. The subject of this photograph is a kleptoparasitic cuckoo wasp, a ruby-tailed wasp (Chrysis sp). A kleptoparasite is an animal that takes food from another that has caught, collected, or otherwise prepared the food, including stored food. In the case of the ruby-tailed wasp, it takes advantage of nests made by solitary bees and wasps, laying it’s eggs within them. 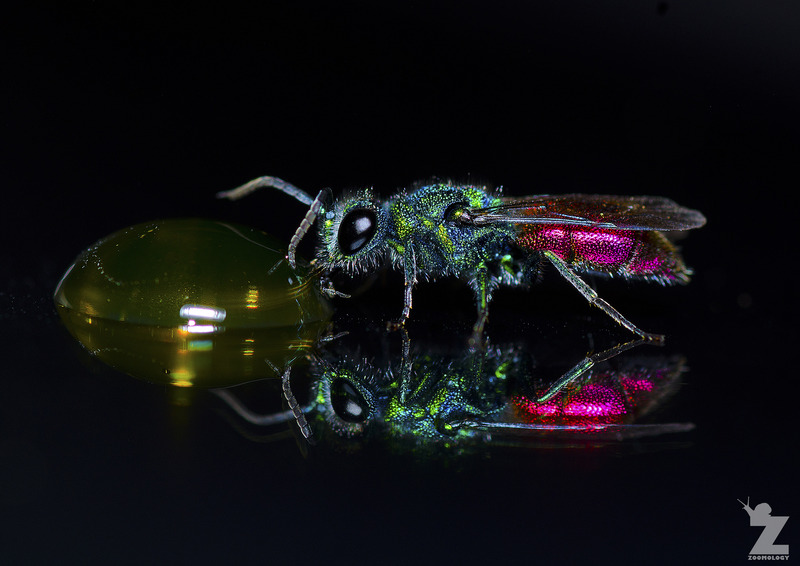 The ruby-tailed wasp larvae then hatch and consume the hosts egg’s/larvae before consuming the food that the host had gathered for their own, now consumed, offspring. This tiny (5mm) wasp was remarkably spotted by my partner, Emma, at some distance glinting in the sunlight. To capture this image, I coaxed the wasp onto the screen of my mobile phone using a droplet of maple syrup. This provided the reflection in the resulting image. The subject of this photograph is a native New Zealand vagrant spider (Uliodon sp). 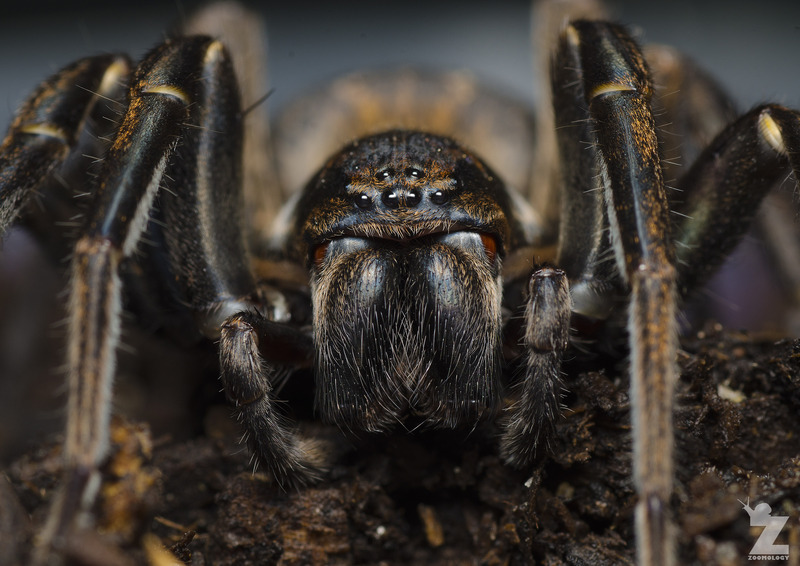 Vagrant spiders are active nocturnal forest hunters, but are often found in gardens under logs. This individual was one of the largest I have come across. It was found while gardening at a property in Whanganui. I made the most of the opportunity and got up close and personal to take this shot. 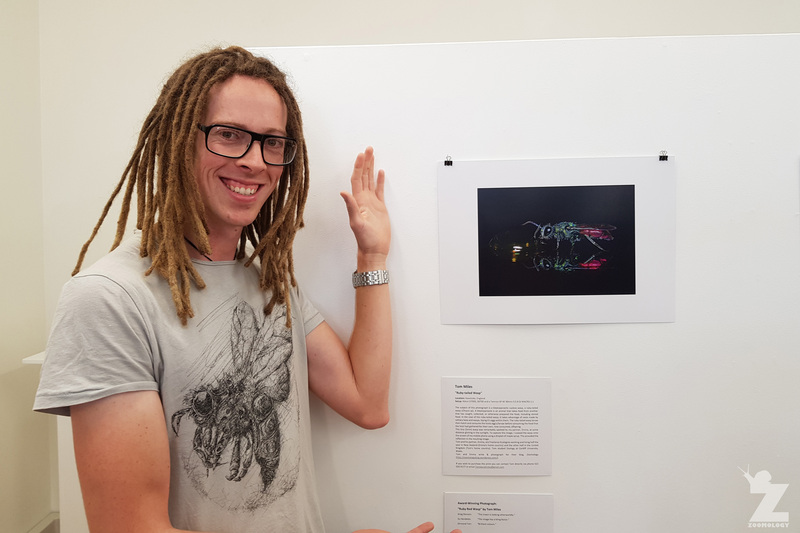 After a drink and chat with other entrants and insect-lovers, Entomologist and competition organiser, Rudi Schnitzler, called everyone’s attention. 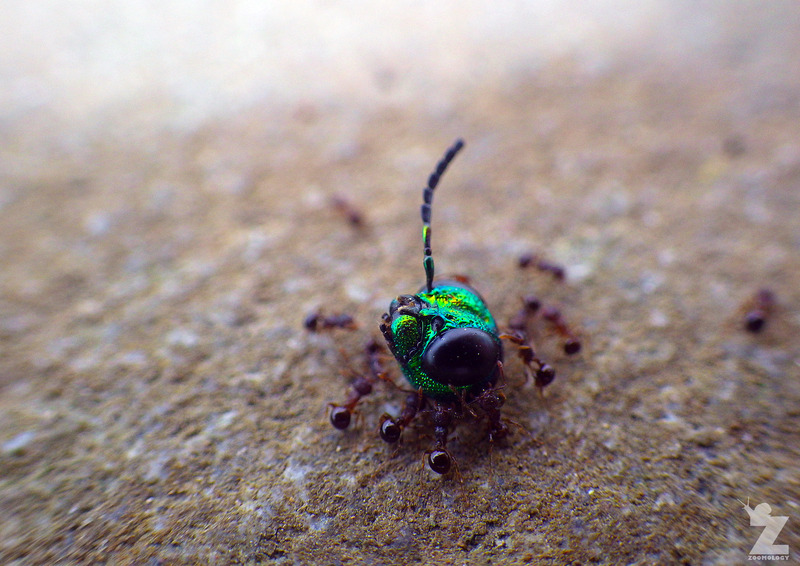 Rudi announced the winner’s name, and it was our very own Tom Miles with his ruby-tailed wasp photo! We’re so excited for you, Tom! Congratulations on the win! Many thanks to the judges, Su Hendeles and Ormond Torr, to Rudi Schnitzler for organising and running the competition, and to the Entomological Society of New Zealand. Awesome! Those are truly stunning pictures! Congrats! Your photo entries are so interesting. I loved the title “Off With Her Head!” and its such an interesting shot! The beetle is like some sci-fi creation. The winning entry I’m already familiar with from your blog but that makes it no less impressive. And the vagrant spider is incredible. So glad you entered the NZ competition while you’re still here and a big “Well Done!” to Tom! Hi Liz! Thank you very much from Tom and I! We definitely had fun getting all these shots. 😀 Yes, I’m so glad we had the opportunity to enter the competition. We actually start heading back to the UK in a week from today, so we just had enough time to take part! Wishing you both all the best for your journey! That’s really great! Congratulations!!! It’s very important to show the varity of insect in a world which loose its little inhabitants. Thank you, Simone! We absolutely agree – it’s great to give these little Earthlings some well-deserved exposure. 😀 In fact, I believe that was the goal of the Entomological Society in holding the competition! They did a wonderful job. Brilliant Tom and what a stunning shot, great winner! Emma your shots are excellent as well. Last year I entered the butterfly image on my blog header into the Butterfly Conservation (Norfolk) photo comp and got 1st pace so I know the feeling! Congratualtions to you both! They are trully stunning photos! Hi Pete! Thank you very much! Wow, such lovely photos! My personal favorite was the spider photograph. It looks so scary yet cool. I think I see why the wasp picture won, however. It looks like it was hard to set up! However, my opinion is that shots that are set up are not as natural and often the photographer has to kill the subject to get it to stay still, so they are not as enjoyable. Still-it is a great photo! I can see why the side view of the colorful ruby-tailed wasp caught the judges’ attention.